Brickhurst planter - 5⅜" (136 mm) high, 5½" (139 mm) diameter. Brickhurst Pottery was set up at Brickhurst, Sussex, in 1952 by Keith (b. 1918) and Fiona (b. 1921) Richardson, and could be thought of as a reincarnation of Dicker Pottery. Keith was an ex-Dicker potter, and he carried some of the Dicker techniques over to Brickhurst as well as employing other potters who had worked at Dicker before its closure in 1957. Among them was Norman Bridges who went on to form Merlin Pottery. Fiona was also ex-Dicker, and it was she who had the onerous task of reinstating the Dicker when the Ministry of Defence relinquished the buildings after the Second World War. 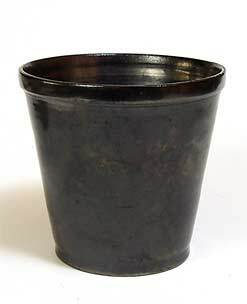 The earthenware pots made at Brickhurst are of high quality and usually have the familiar black metallic glaze associated with the Dicker. Brickhurst Pottery closed in 1982 but Keith and Fiona still live at Brickhurst Farm.